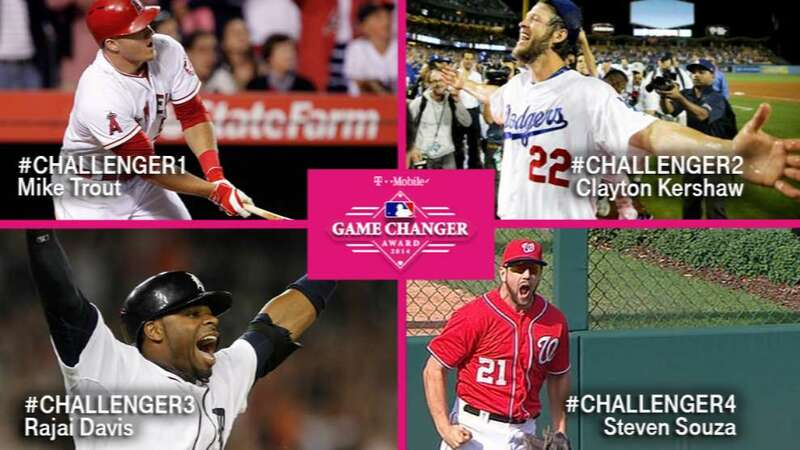 official 2014 T-Mobile MLB Game Changer Award! 2014 T-Mobile MLB Game Changer Award winner. Stay tuned to find out who won! Can't get enough? Watch previous T-Mobile Game Changers >> T-Mobile is changing the wireless industry, click here. No purchase necessary. Enter by 9/28/14 at 11:59 pm ET. Open to legal residents of the United States including its commonwealths, territories and possessions who are of legal age of majority in their jurisdiction (and at least 18 years of age) at the time of entry. One hundred sixty-nine (169) prizes will be awarded. EXCEPT WHERE NOTED OTHERWISE IN THE RULES, TRANSPORTATION TO/FROM GAME AND LODGING NOT INCLUDED. Odds of winning depend on the number of eligible entries received as of the applicable drawing date. Enter online or by mail.Â Limit one (1) entry per person/Facebook account/Twitter account/email address per day. Void where prohibited. See official rules for prizes, drawing date and complete details.